Greybrook Realty Partners is expanding its Canadian presence outside the Greater Toronto Area and Southern Ontario by buying and renovating existing multi-unit residential buildings in Montreal. The move is one of several initiatives on the go by Greybrook and its parent company, Greybrook Capital, which also plans investments in several major Canadian and U.S. developments. He says Greybrook recently came up short on acquiring a value-add building in downtown Montreal, but is seeking to acquire a portfolio of 80 residential rental units in suburban Côte Saint-Luc. Greybrook is also buying “value-add opportunities” in Quebec City where it has three buildings under contract. Given current price pressures in Toronto and other parts of Canada, he says, Montreal is “relatively affordable” both in terms of residential rentals and sales. The 88-storey high-rise condo project at 300 Biscayne Boulevard in downtown Miami will have an estimated completion value of US $970 million and Greybrook’s equity investment is US $37.37 million. It’s being built by New York developer Property Markets Group and will feature more than 500 luxury condos and a hotel. “We are in the process of finalizing a partnership with a world-renowned branded hotel residence,” he says. Greybrook is an equity partner as well with Property Markets Group, to the tune of $40.8 million, in the proposed 400 Biscayne Boulevard in Miami, which plans 690 residential rental units. 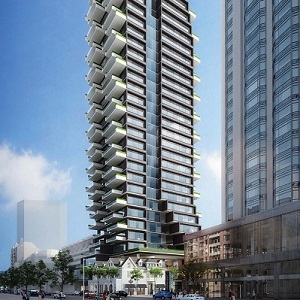 Politis adds a proposed $400 million condo development Greybrook is planning in partnership with Empire Communities in Toronto’s Yorkville neighbourhood could be one of the most luxurious in the country. 140 Yorkville should come to market in 2019 and construction should begin nine to 12 months after sales begin, he says. Greybrook’s equity investment in the development is $41.4 million. The high-end condo residence will have much higher ceiling heights than normal, meaning that it will be 29 storeys instead of a potential 38 to 40 storeys. There will be 90 boutique residences with an average size of more than 2,000 square feet each, and a number of high-end features such as private elevators. Greybrook Realty Partners is part of Greybrook Capital, a private equity firm with real estate and health divisions. Politis is a partner in Greybrook Capital. Greybrook Realty Partners has invested in more than 50 real estate developments with an estimated value approaching $15 billion, Politis says. EDITOR’S NOTE: This story was edited to remove certain proprietary information at the request of Greybrook.